Being a capable hunting partner and an affectionate companion, the Jagdterrier is a perfect choice not only for hunters but active dog parents who are looking for a devoted family friend too. On the field, the Jagdterrier is a dedicated and highly-esteemed hunter. Off the field, he is an excellent pet. Considering the Jagdterrier’s diverse personality, it’s no wonder that I have a soft spot for this ‘jagged’ little breed. And, it’s not just me – his popularity is steadily on the rise. So let’s dive deep and see what this little powerhouse of this pooch is all about. #4 How Long will my Jagdterrier Live by my Side? Do they tend to bark a lot? Will my vacuum cleaner be attached to my body? #8 How often will you be visiting the vet? #10 Where are your manners? Are they an excellent choice for first-time owners? #11 What Organizations are Jagdterriers Recognized by? #12 What’s this Little Hunter going to Set me Back? #13 What the Jagdterrier Puppy needs? The Jagdterrier (also known as German Hunt Terriers or Deutscher Jagdterriers) is a fierce and tenacious hunter capable of challenging not only common prey animals like game, wild boars, foxes, weasels, and badgers, but also dangerous prey like bobcats and cougars. They also hunt for squirrels and raccoons too through tree hunting. Judging his hunting skills by its height and weight is a huge mistake. On the field, the German Hunt Terrier is a bright, determined, robust, brave and unrelenting hunter. Bold, steady and confident, he will not back down from any challenge. This dog is hugely intent in the hunting pursuit. Basically, out in the field, he rocks! To get a better idea of this hunter’s skills, watch the video below. The purpose of the Jagdterrier breed is born out of three notions – pride, perfection, and purity. These notions also reflected the German obsession with nationalism and superiority. Developed at the turn of the 20th century, the Jagdterrier is a relatively young breed. Their development is the result of the efforts of four hunters, breeders, and enthusiasts who broke away from the German Fox Terrier Club and dedicated themselves to creating a new and improved hunting terrier. Early Jagdterriers were created by mixing the Old English Fox Terrier with a variety of Black and Tan Hunting Terriers. Other ancestors of the breed include Welsh Terriers, English Wirehaired Terriers, and German Pinschers. After years of selective breeding and careful offspring management, the result was impeccable – a functional, all-purpose hunting dog. Even today, this ultra-efficient breed is known to be the perfect purebred hunting machine. The Jagdterrier is almost exclusively used for hunting purposes. Although today the number of dog parents who choose to keep a Jagdterrier as a pet is on the rise, as we mentioned earlier. 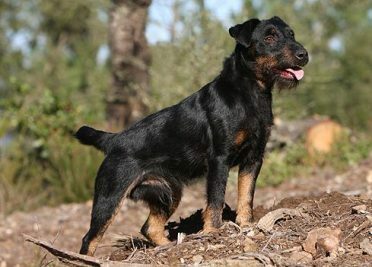 The German Hunting Terrier is a robust and sturdy dog with rectangular body shape. The overall body construction has a muscular yet sleek appearance. 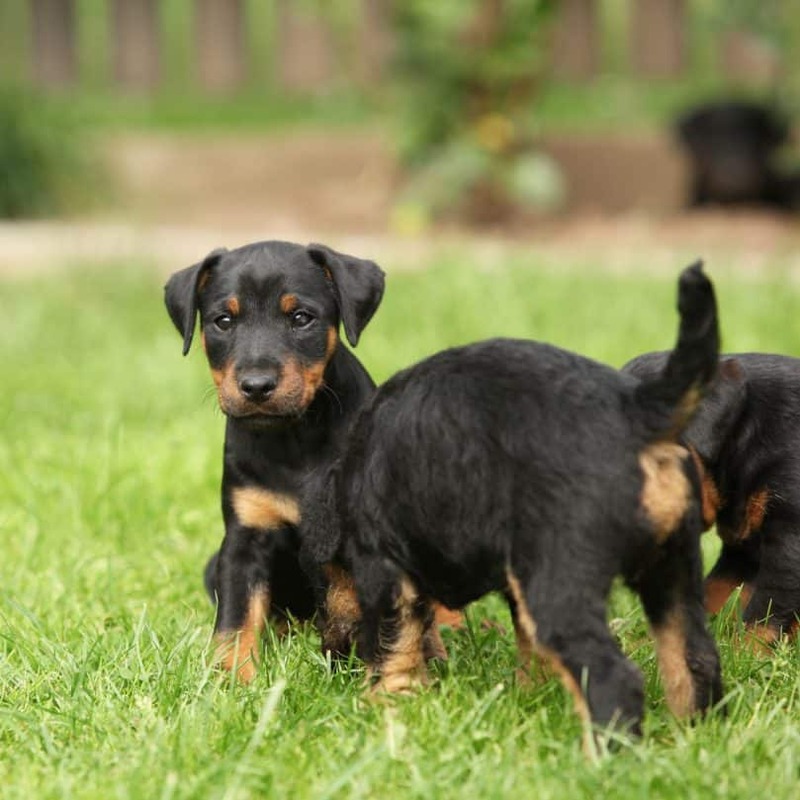 They are small, compact and well-proportioned dogs, just like a rottweiler pup! The Jagdterrier has a long but not too narrow head with a fiery facial expression. The muzzle is strong, elongated and ends in muscular and punishing jaws. The oval-shaped eyes are small and dark. The V-shaped ears are semi-dropped and set high. He also has a long neck that gets wider as it reaches the shoulders. Perfectly designed for entering small dens, the chest is broad and narrow. The length of the legs is ideally proportional to the rest of the body. The tail is set reasonably high and straight. Their coats are wiry, harsh and short. It’s also thick, ample and always black and tan colored. However, the shade of tan can vary significantly from creamy tan to rusty copper. The tan markings are on the muzzle, eyebrows, feet, and belly. The eyes, eye rims, lips, and noses should be black, but in some rare cases, they can be brown, although this is not an accepted color for the breed. Both male and female Jagdterriers are 13 to 16 inches (33 to 41 centimeters) high at the shoulders. Male Jagdterrier weighs 20 to 22 pounds (9 to 10 kilograms) while females weigh a little bit less around 17 to 19 pounds (8 to 9 kilograms). The average lifespan of Jagdterriers is estimated to be between 10 and 12 years. So there’s plenty of time for you and your Jagdterrier to bond and spend time together whether out on hunting trips or charging around your local neighborhood trying to make sure he gets that much-needed exercise! German Hunting Terriers are highly intelligent dogs that thrive on having something to do. They are loyal, affectionate and committed companions. Their lively spirits are far more prominent than their actual size and proportions. Watch the video below to learn more about the Jagdterrier’s temperament. Playful, energetic and friendly, they get along well with children. They are patient and gentle with kids of all ages. They are also protective of them too, which is a fantastic quality to have in a dog. Jagdterriers are not very dog-oriented as a breed. In fact, they tend to be dog-aggressive. If properly socialized and raised together they can learn to get along with other dogs. However, they prefer being the only canine baby in the house. 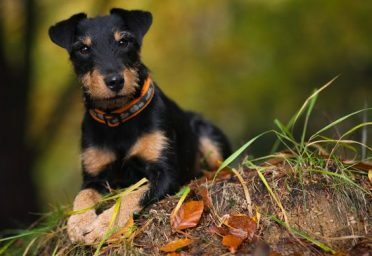 Due to its hunting heritage, the German Hunting Terrier has solid prey drive, and you can’t trust them with other smaller dogs, cats and rodent pets. If raised together and adequately and extensively socialized, this dog can learn to live with other dogs, but it will not be happy about it. They have a soft spot for fun and play. They enjoy having something to do and if that something is playing, running and jumping around, that’s a bonus. Their fun-loving and highly-energetic nature makes them the ideal play-time partners. Generally speaking, German Hunting Terriers don’t suffer from separation anxiety. However, if left alone for too long he will find a way of amusing himself. Unfortunately, the Jagdterrier’s definition of fun and amusement is probably not the same as yours and often involves plenty destructive activities. 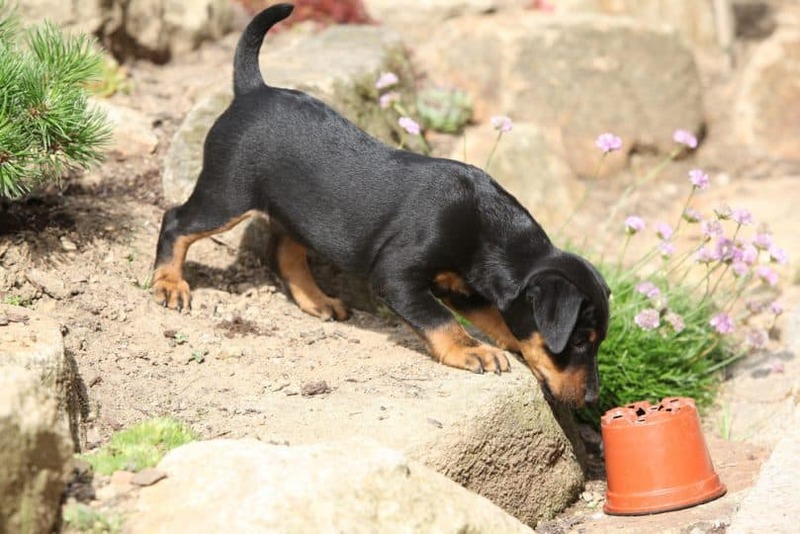 Jagdterriers love the sound of their own voices and are not ashamed to show it – they enjoy barking all the time! Besides barking for entertainment, they will bark for attention and as a sign of protest too. Because of their alert nature and bold personality, they make excellent watchdogs. They are adaptable, courageous, strong-willed and reliable little dogs. The Jagdterrier’s restless spirit and go-all-day stamina, require a great deal of physical activity and mental stimulation. This dog needs a job to do and a sense of purpose. Due to this, it’s not suitable for people who like to take it easy. Even though the German Hunting Terrier is an apartment-friendly dog that can be quite active indoors too, it needs extensive outdoors time. Long walks and jogs are the perfect way to burn off all of that excess energy and avoid any destructive and challenging behavior. So get those running shoes out and prepare to be pulled and dragged along by this little, yet mighty, dog! Cloth – dampened with water to wipe the coat and remove loose hairs. Thankfully not, as the German Hunting Terrier’s thick and short coat is relatively easy to groom and maintain. In general, dogs from this breed shed moderately. However, shedding is more pronounced and intense during season changes. A consistent and regular brushing schedule will sort it out in no time! Hopefully not that often, but there are some health issues you should be aware of. One of the most common inherited diseases in this breed is an eye issue called primary lens luxation (PLL). This is a painful condition that develops when the dog is between three and eight years of age. Unfortunately if not treated, it can quickly lead to blindness. They also have extremely sensitive stomachs prone to irritation and ulceration. Therefore it is of paramount importance to avoid using non-prescribed and off-label drugs and medicines. Just like every other dog breed, the Jagdterrier needs to get his vaccinations. The vaccinations they’ll need and how often they’ll need to be done depends mainly on where you live and which diseases are typical for your area. Talk to your vet and set up a schedule. Unless you want your German Hunting Terrier to have its own offspring when it grows up, it is advisable to have it spayed/neutered. By spaying and neutering, you not only prolong his life but also decrease risks of developing certain medical conditions. If the Jagdterrier feels food, then you can be guaranteed he’ll be there in a flash! They are prone to gaining weight so you’ll have to watch their calorie intake and weight carefully. The key to good health is a well-balanced diet. Therefore understanding their nutritional needs is crucial. Those needs depend on several factors such as age, body composition, gender (plus neutered/spayed), temperament, activity levels and taste preferences. If you’re not sure what type of diet your Jagdterrier needs and how much food they should be getting, talk to your vet, breeder or a dog nutritionist. Our diet recommendations to various breeds could be beneficial too. In the right hands, German Hunting Terriers are relatively easy to train. They are intelligent, eager to please and respect their leaders as well as their boundaries. The key to raising a well-mannered Jagdterrier is keeping the training sessions short, exciting and diverse. As mentioned before, they are naturally kind and protective of small children but not very fond of other animals. Therefore it’s crucial to socialize them early on. Incorporate this into your training schedule. Also, as fair warning, these dogs love to dig so that you might be saying goodbye to your well-maintained backyard! In spite of its natural trainability, the Jagdterrier, if not correctly approached can be a handful. Therefore this breed is not recommended for first-time owners. The Jagdterrier breed was recognized and approved by the International Cynologic Federation in 1968. As it stands to date, they are only recognized by the United Kennel Club and by The Internationaler Verband für Deutsche Jagdterrier in Germany. The Jagdterrier’s price varies between $300 and $500. Before buying or adopting one of these little guys, ask the breeder about its parents’ health statuses. The annual medical (vaccines, external and internal parasite prevention, vet check-ups and insurance) and non-medical cost for this breed are around $420-$780. A reputable breeder will show you health certificates. They should also have both parents and the offspring subjected to several tests necessary for determining the health and the genetic quality of the puppies. There are many Jagdterrier breeders kennels. Before your new puppy arrives, make sure you understand its needs. Additionally, make sure you have all the supplies your new little bundle of joy needs. Keep in mind that Jagdterrier puppies need several meals a day. It is also advisable to feed him the same formula that the breeder used for at least a week or two. Your German Hunting Terrier puppy also needs to be taken to its toilet area each time it wakes, after each meal and after each session of activity and play. Expect lots of messes until you can housetrain your new addition to the family. Socialization is the key to raising a well-mannered and well-rounded puppy. The more new and exciting experiences they have at an early age, the less fearful and more social it will be. Make sure your puppy meets new children, adults, and other dogs. You also need to expose him to unknown environments and situations. The first attributes that come to mind when describing the Jagdterrier are hunting and sporting dog. However, when it comes to this breed, there is more to it than what meets the eye. Jagdterriers are quite complicated dogs – lively, spirited, fast and relentless when working, while regal, noble and dignified when resting. They are devoted and fierce hunters on the field and loving, cuddly companions at home. No matter the circumstances, these well-muscled yet graceful dogs are worthy of our respect and devotion. 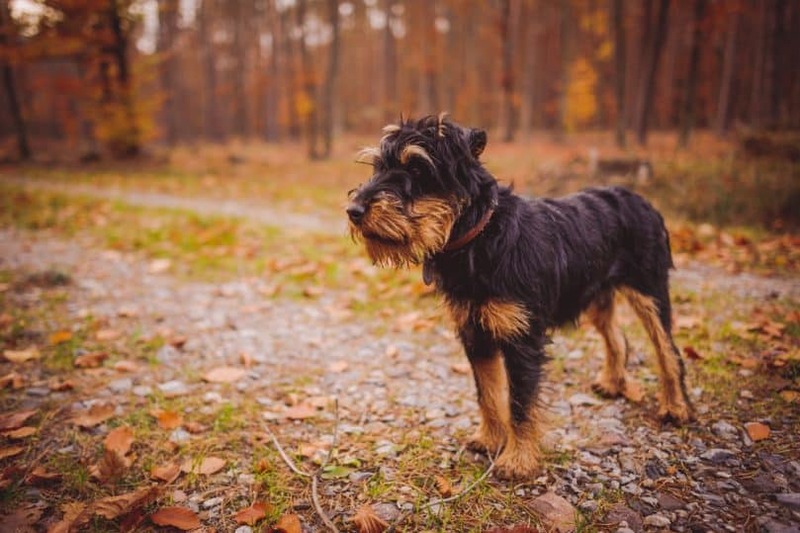 Is the Jagdterrier the right breed for you? Perhaps you already own one and can’t stop bragging about it? Leave a comment below and support other Jagdterrier enthusiasts.